Readers of this blog know I'm a fan of Hindu Push-Ups and Squats. 15/15s: Set a timer to go off every 15 seconds for at least 10 minutes. Do Hindu Push-Ups for 15-sec., rest 15-sec., Hindu Squats for 15-sec., rest 15-sec., etc. Don't worry about reps; just try to maintain a steady pace. Escalating Density Training: Set a timer for somewhere around 10-20 minutes. Go back and forth between Hindu Push-Ups and Squats. Go at your own pace. Keep track of your total reps, and try to top that next time around. Ladders: This one is real quick. 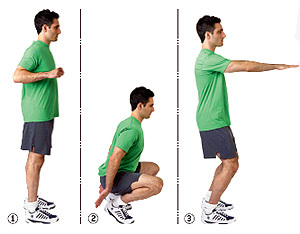 Do 10 Hindu Squats and 1 Hindu Push-Up. Then do 9 Squats and 2 Push-Ups, etc., until you finish with 1 Squat and 10 Push-Ups. Another ladder variant: Do 1 Hindu Push-Up and 2 Hindu Squats. Than 2 and 4, 3 and 6, etc. until you start getting near failure. Then restart at the beginning. For a really grueling workout, do 10 Hindu Push-Ups, 20 Hindu Squats, and 30 Kettlebell Swings. Repeat, resting as needed. When my friends and I do this one, we go to 11 sets, in honor of Spinal Tap. Many of these workouts can be used as a warm-up or a finisher, or as a quick routine when you are pressed for time. Experiment, make changes, and create your own workouts. The possibilities are endless!